Some of you may remember. On June 16th Honda made an announcement regarding the 2014 & 2015 Honda Grom. 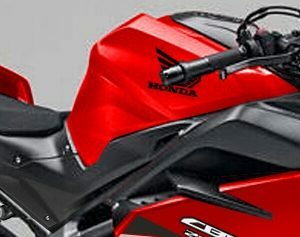 It was a Stop Sale / Recall because of a sticker placed on the swing arm that had incorrect emissions information. You can read about the prior announcement by clicking here. At that time we didn’t have an ETA or were aware of when new stickers would be sent out so we could resume sales of the Grom. Thankfully all of that changed today with the announcement below. 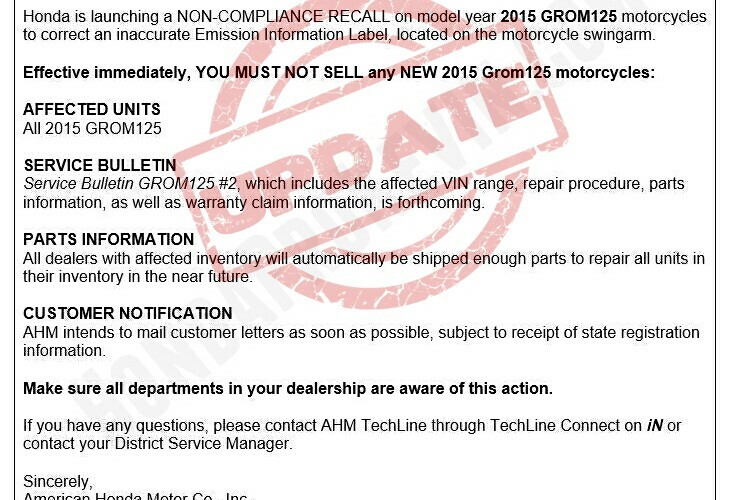 On June 26th, American Honda announced a Non-Compliance Recall for all 2014 & 2015 Honda Grom 125 (GROM125E / GROM125F) motorcycles for an incorrect Emission Control Information Label. In support of this campaign, on Monday June 29th, American Honda allocated labels to all affected dealers to cover 100% of your dealership’s inventory and sold units. Most affected dealers will receive labs on Tuesday June 30th while some may receive on Wednesday July 1st via FedEx. To anyone waiting to purchase their new Honda Grom but can’t because of this Stop Sale / Recall can now finally pick there’s up within the next couple days. Thanks to Honda for getting on the ball and getting everything squared away ASAP.